Famous for its scenic beaches and a blend of Indo-Portuguese culture, Goa is a favourite destination for tourists – Indians and foreigners alike. But the state which draws so many tourists every year offers a dismal transportation facility. The capital city of Panaji has very less government-owned buses to ferry passengers to some prominent tourist destinations. Cashing on this, private taxi operators and auto-rickshaw drivers charge exorbitant money from the tourists. 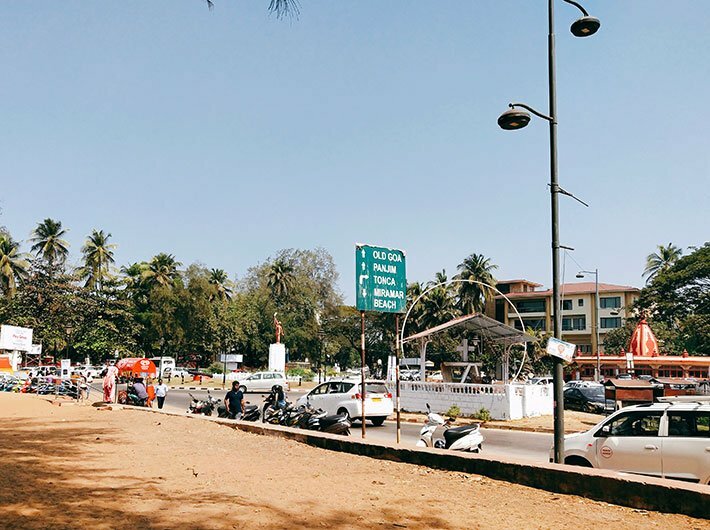 During a recent visit to Goa, I was in for a surprise when I found that Panaji did not have enough AC and non-AC buses run by the state transport authority. The city mostly relied on several private non-AC buses. A day’s sightseeing, for 80 km distance and eight hours duration, is likely to cost around ₹2,000 to ₹2,500 in a private taxi. Moreover, the services of non-AC private buses from Panaji to places like Candolim, Calangute, Anjuna, Baga, Morjim and Arambol are limited till 7 pm only. As I result I was dependent on private cabs to return to the capital after coughing up a huge amount every time. For example, travelling from Panaji to Calangute (a distance of 15 kms) would cost Rs 10 per person in a private bus but one has to shell out somewhere between Rs 350 and Rs 400 or even more in a private taxi. During night hours, this amount obviously increases. Private buses though offer a cheaper deal and charge somewhere from Rs 10 to Rs 20 per person depending on the distance, but they do not issue tickets to passengers and often have long stoppages to accommodate more people, wasting a lot of time. I was not able to spot a single Ola, Uber or Meru in Goa. Having transformed public transport of metropolitan cities like Delhi and Mumbai I was confused why these cab aggregators are missing from the country’s favourite tourist destination. When I asked Goa's assistant director of transport (headquarters) Rajesh Naik over phone about this he said that Ola and Uber have never approached the government of Goa and the sector is always open for them. Naik also said that the state has enough taxi operators and maintained that there are adequate numbers of public-sector buses as well. When I discussed this issue with the locals they said that the nexus of local taxi and tour operators is very strong and they have a monopoly; they strongly oppose Ola and Uber taxi aggregators to come and operate in Goa. A private taxi driver Mahesh said that private taxi operators do not want Ola and Uber to launch their services as it would result in heavy competition and private players will have to bring down tariffs to remain in the competition. A local Nandan Jaikumar said the locals use private buses at cheaper rates and they never take taxis for reaching offices but tourists who wish to travel in cabs often end up paying hefty charges to operators. With no public buses and high prices of private cabs I tried Goa Tourism Development Corporation’s app-based taxi service ‘GoaMiles’, which was launched by Goa chief minister Manohar Parrikar in August 2018 in Panaji. The cab service claims to offer cheaper rides as compared to other private operators and has 350 cars on the road. I booked a cab from GoaMiles app from Dabolim Airport to Panaji (around 25 kms) which charged me around Rs 720-800 as compared to Rs 1,050-1,100 a private taxi would have charged. The difference in price was obviously not much and considering the heavy flow of tourists, GoaMiles needs to add more fleets of cabs to take on private cab operators. If other tourist destinations are compared with Goa, the cities usually have an adequate fleet of state transport buses to offer economical rides to passengers. The government of Goa needs to take more efforts to strengthen state-run transport not only for the tourists but locals as well.